The weather was great during my rest day at Innerleithen. So I decided to map the town, then sat around for a bit in the sun, followed by cycling a small amount of the main tracks at the local mountain biking area: one of the 7 Stanes sites. I wasn’t mountain biking though, just casually climbing up, taking in the views and plenty of photographs. The journey today essentially followed the river Tweed. It started out on a quiet road out of Innerleithen and continued that way for several miles. There then followed a choice section either traffic-free or on road. The traffic-free section is pretty bumpy, but I chose that because I didn’t think that OSM had it mapped yet. After a few more roads I passed through Galashiels and Melrose. Whilst following all of this there were numerous local cycle route signs, like those I found in and about Innerleithen, so I tried to map these as well. At Dryburgh I took a short rest then took a temporary diversion from NCR1 to walk with my bike to Wallace’s statue nearby. It’s impressive. Interestingly for something so large I managed to walk practically straight past it before needing to backtrack and find that a side path leads to it. After some small sections of quiet B-roads and a couple of short stretches on A-roads the route took some exceedingly quiet smaller roads. It regularly got within a mile or two of the Scotland-England border but didn’t cross partially because of the lack of bridges over the river Tweed where the border lies at this point. It did eventually cross though, just before Norham. 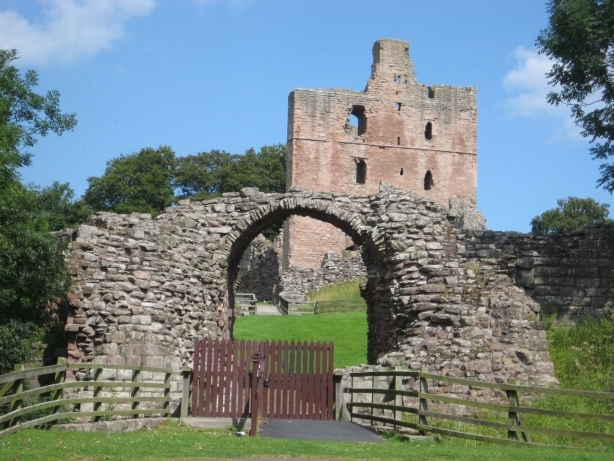 NCR1 at Norham passes the impressive castle there on its way out of the village. Only a few more miles further on I found myself crossing the border once again, back into Scotland. 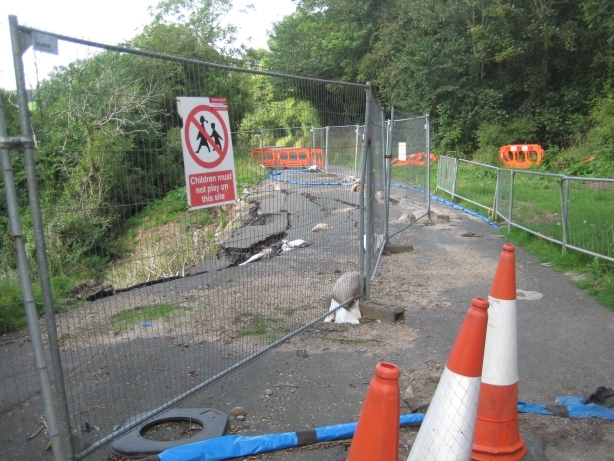 There was almost a problem here; the road towards the Union Bridge that crosses the Tweed again into Scotland was closed, and for a good reason: part of it has collapsed. Luckily it’s passable as a cyclist, so I didn’t need to take a lengthy detour as a result. About an hour later I arrived at my accomodation in Berwick-upon-Tweed quite a bit earlier than my planned time. Luckily they unexpectedly have WiFi Internet access, so I’ve been able to bring this blog back up-to-date. This entry was posted on Friday, August 7th, 2009 at 19:22 and is filed under Cycling. You can follow any responses to this entry through the RSS 2.0 feed. You can leave a response, or trackback from your own site. They are still working on the collapsed road then. Glad to see things are going well. I was pretty sure I’d seen this collapsed road on VolunteerNet (RangerNet) before, I’m glad that you’ve half confirmed that for me! Yes, things are going fine; it’s just the Internet connectivity that’s proven awkward — I wish my dongle had arrived before I left (Probably sitting on my doormat back at home as I type…well it better be).